DSJ Series Drying Hammer Crusher is suitable for crushing and drying soft or nonabrasive materials, eg:gypsum, chalk, clay, slurry, filtered cake, etc. It can break up, dry and calcine industrial byproduct plaster, flue gas desulfurized gypsum. This equipment is of high efficiency and low energy consumption. It has the function of breaking up and crushing the materials while drying them. The rotary totor breaks up the materials, hot blast dries them, and air flow takes the crushed and dryed materials into separation chamber. Afterwards, fine powder is separated in cyclone, while coarse particles goes back to the hammer crusher and crushed again. In gypsum board industry, the rotor on DSJ Series Drying Hammer Crusher can break up and throw the desulfurized gypsum slag, whose water content is no more than 12%. During this process, the gypsum slag exchanges the heat with the intake hot air of 550℃, and then the max water content of the material is 1%, which goes into riser from outlet duct and then hot air takes the material into the next process. This machine can also be used to dry and crush filtered cake in cement industry and calcium carbide slag in environmental protection. DSJ Series Drying Hammer Crusher adopt reasonable and reliable process technology, high-quality material and advanced automated processing equipment, which ensures the reliable and steady operation, and convenient maintenance. Each environmental indicators of this equipment are in line with the requirements of the country. Desulfurized gypsum slag used to be processed through the landfill, which seriously pollutes the environment and uses the farmland. 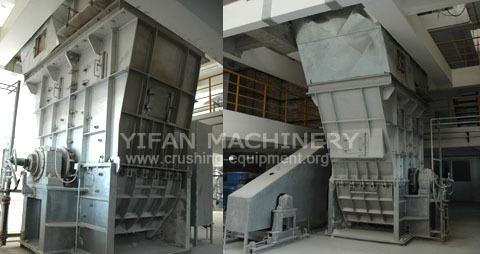 Nowadays, the desulfurized gypsum slag can be used as construction gypsum powder, after being processed by this machine. What's more, its performance is better than that of natural gypsum. It is high-quality raw material to produce gypsum board. Gypsum board production line in Taicang Beijing New Building Material Co.,Ltd. attached to China National Building Material Group Corporation.